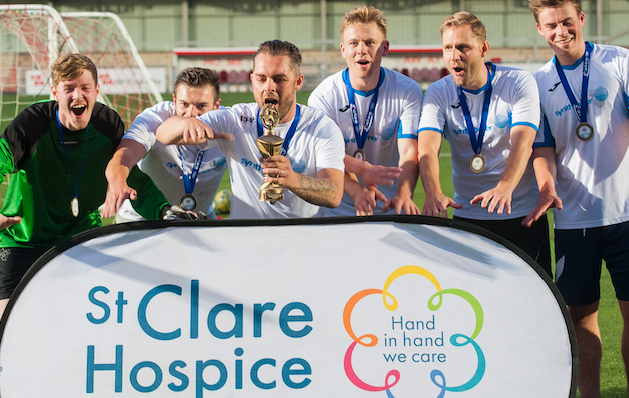 Hosted at Harlow Town FC Arena, the tournament will take place on Thursday 20th June 2019 from 5pm – 11pm. So far, five local businesses have signed up to compete for the St Clare trophy, entering seven teams between them. However, organiser Amy Jacobs from St Clare is hoping to beat last year’s total of 14 business competitors, who between them entered 20 teams into the competition. “We’re on the lookout for businesses to come and show off their ball skills on the pitch at our annual footie fundraiser!” says Amy, Corporate Fundraising Manager at the Hastingwood-based Hospice. “Everyone who works locally is welcome to take part. All you have to do is round up your team at work and get in touch to sign up. This round-robin 5-a-side tournament always offers an excellent night out for everyone, and is such a great teambuilding opportunity to get involved in. “Last year, the event raised around £5,000 in total, so we’re hoping to top that this year to raise even more for the Hospice. Although the event is such good fun and a real laugh, the difference it really makes goes far beyond a simple football match. The vital funds we raise go towards making a difference to the lives of local people who are living with a life-limiting illness – and their families,” says Amy. “So if you think you have what it takes to win the highly-coveted St Clare football trophy, sign up today! Registration to take part is now open and we would love to see you there!” Amy added. Up to 8 per team can enter the St Clare Business Football Tournament, with a roll on/roll off sub system. It is £250 per team to enter and each player is encouraged to try to fundraise on top.